VISIONEFX provides on-going organic SEO that attracts online leads and new projects for Inlet Contracting. After the first redesign done by VISIONEFX for Inlet Contractors we continue to provide website maintenance, webpage updates and SEO – search engine optimization‘ to keep online projects leads coming into the website. 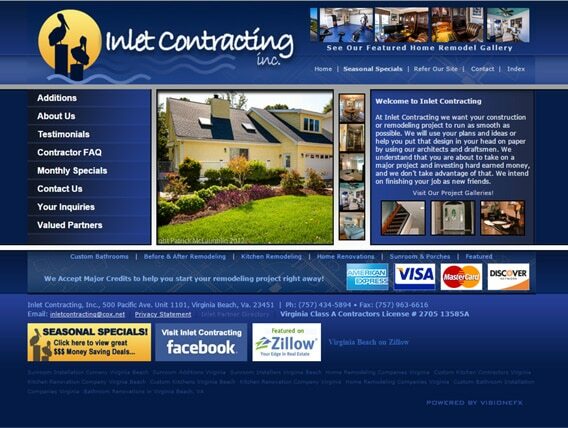 This is the 2nd redesign for InLet Contractors since becoming a VISIONEFX client many years ago. When searching Web design Virginia Beach, Web development VA look no further than the web design experts at VISIONEFX. VISIONEFX, a Web design company based in Virginia Beach, VA provides extraordinary web design for small and large businesses throughout the United States to include; custom web design, web development, e-commerce web design, Word Press web design, Joomla web development, SEO and web maintenance services. Call: (757) 619-6456 or email info@visionefx.net. For more information about web design Virginia Beach Va contact here.